Posted By:Unknown | At:11:04 AM Be the first to comment! WASHINGTON (AP) — From the bungled rollout of “Obamacare” to New Jersey gridlock to the hue of John Boehner’s tan, all was fair game for President Barack Obama and his spirited but pointed humor when he took center stage as comedian in chief. 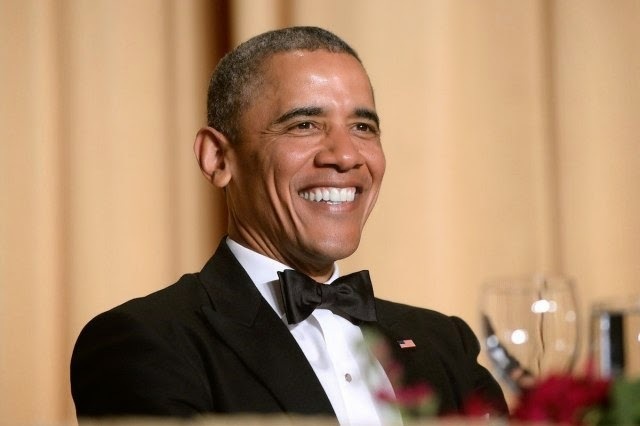 At the annual White House Correspondents’ Association dinner on Saturday, Obama observed that the House speaker’s fellow Republicans have lately been as critical of Boehner as they’ve been of him. “Which proves that orange really is the new black,” Obama said to roars of laughter. In his own stand-up routine, Obama didn’t waste any time turning his barbed jokes toward the news media. The correspondents’ association, which represents the White House press corps, celebrated its 100th anniversary. -Glenn Thrush of Politico and Brianna Keilar of CNN won the Aldo Beckman Award, which recognizes excellence in the coverage of the presidency. -Peter Baker of The New York Times and Peter Maer of CBS News won the Merriman Smith Award for deadline coverage. -Megan Twohey of Reuters and a partnership between The Center for Public Integrity’s Chris Hamby and ABC News’ Matthew Mosk and Brian Ross won the Edgar A. Poe Award for coverage of issues of national significance. -George E. Condon Jr. of National Journal received the first President’s Award for exceptional service to the organization. The organization also honored the late Harry McAlpin, the first black reporter to attend a presidential news conference, by establishing a scholarship in his name. McAlpin had been denied membership to the WHCA while covering the Roosevelt and Truman administrations because of his race.